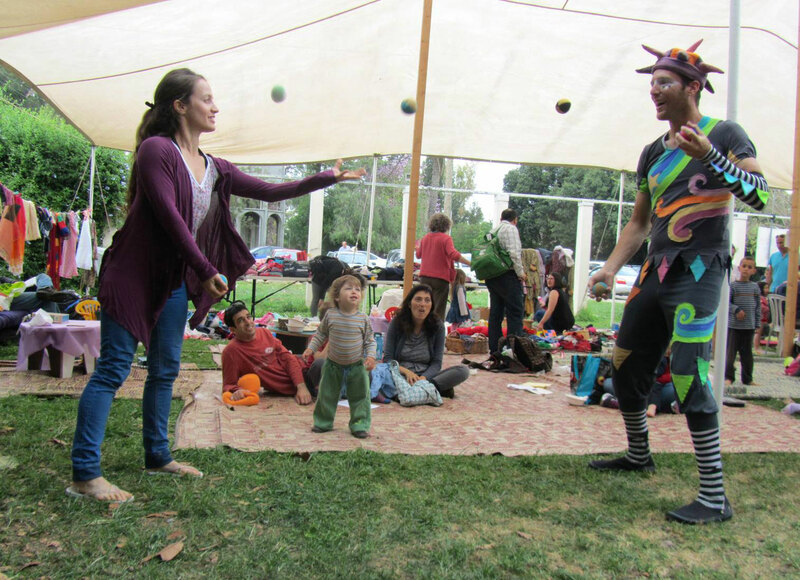 This year, I was fortunate to be part of a special project: the integration of circus studies with the curriculum of the bi-lingual [Waldorf] class in Ein Bustan. I go to this magical school every two weeks, in order to teach circus skills. We focus on two main techniques - acrobalance and juggling. When a relationship was formed between the two organizations (Ein Bustan and the Israel Circus School) our joint cooperation seemed obvious and followed quite naturally. Both initiatives share common values, and an underlying desire to encourage growth and healing in the community. We hoped that through our joint project the [Arab and Jewish] children that come from different cultures would undergo a process of learning a new, common language - the language of the circus, thus creating another level of connection between them. Acrobalance - a technique of building pyramids in couples or in a group, that is based on mutual attentiveness and awareness of the other. Studying this method contributes to the development of trust, listening to the other, boundaries, balance, and overcoming fears. Juggling - a technique of working with an object, which is based on coordination, an detaches values of persistence, patience and concentration. Practice provides satisfaction, joy, increased self confidence, and an experience of success. Each of our sessions starts with a circle, in which we recite a short verse, which prepare us to brings our attention to our bodies and their movement. Then we get ready for action: we continue with a physical warm up, waking up all of our limbs, strengthening muscles, and developing flexibility. Sometimes we warm up by doing a movement game, which creates a group dynamic that is full of fun and joy. The main part of the lesson is dedicated to learning the techniques. In order to build a pyramid, it is necessary to hold on and to let go, to lean and to support, to pay attention - and to take responsibility. When the children succeed in performing the exercise, they demonstrate it to the rest of the class, and thus they learn to encourage and .appreciate each other. This spring we held a joint charitable event with the Ein Bustan community at the Israel Circus School, and the proceeds were dedicated to covering the expenses of our joint project. 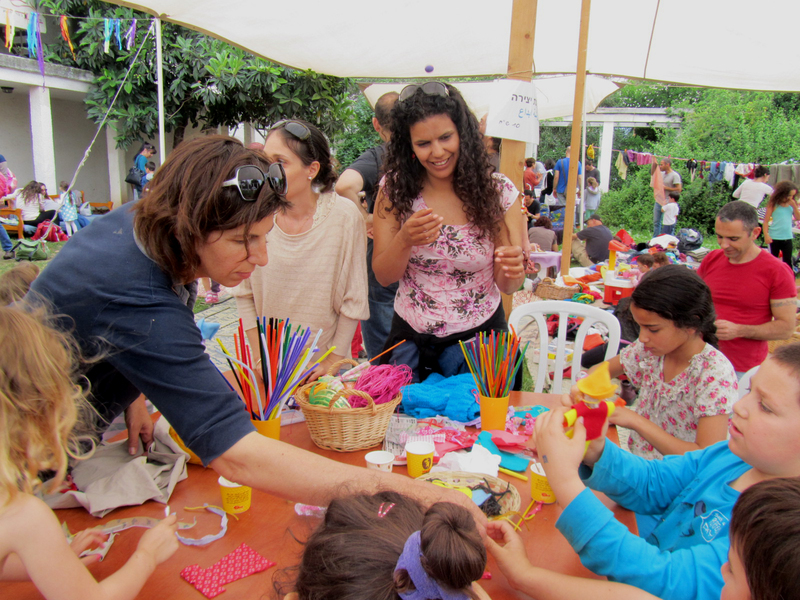 We invited [Arab and Jewish] families from the entire region, and th event included circus skills workshops [such as balance beam, juggling, acrobalance, aerial acrobatics], craft workshops, a second hand clothing market, markets with home made food, and more - all with an emphasis on multi-culturalism. The high point of the event was a circus performance by the amazing “Galilee Circus” - an Arab and Jewish troupe of youth performers from northern Israel. The event was wonderful, full of joy and community participation. The volunteer efforts of the Ein Bustan families were impressive and contributed to the success of the event - each person gave his best effort and the result was wonderful. Additionally, the event was a great way to reinforce the relationship between the two non-profit organizations, to publicize Ein Bustan’s activities and to attract more students to Ein Bustan’s kindergarten and school. Currently in class we are in the process of preparing a circus performance that will be a summary of our activities this year. We will perform at the Shavuot (Harvest Festival) community celebration of the Ein Bustan families. According to tradition, on this holiday the [Jewish] people brought their first fruits of their harvest to the Temple in Jerusalem, and appropriately there is no more suitable time than this to present our “first fruits” as a young circus group. After having seen the performance of the Arab Jewish “Galilee Circus”, we hope to see them as a model that can be imitated, and to develop a generation of young Arab and Jewish circus people from our region, who can cooperate and create an enjoyable and high quality performance, and will prove that when working together - the sky is the limit.